In recent posts we have dealt with sending a binary message to extraterrestrial intelligence, helicopters in ancient Egypt, and a creature in southern Africa that looks like some bizarre three-way cross between a human, a bat, and a pig. So I'm sure that what you're all thinking is, "Yes, Gordon, but what about pet teleportation?" At this point, I should stop being surprised at the things that show up on websites such as the one in the link above, from the site Mysterious Universe. 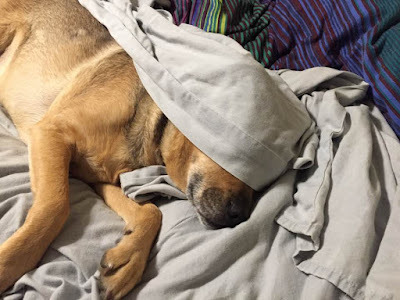 In this particular article, by Brent Swancer (this is not his first appearance here at Skeptophilia, as you might imagine), we hear about times that Fido and Mr. Fluffums evidently took advantage of nearby wormholes to leap instantaneously across spacetime. In one such instance, Swancer tells us, a woman had been taking a nap with her kitty, and got up, leaving the cat sleeping in bed. Ten minutes later, she went back into the bedroom, and the cat was gone. At that point, the phone began ringing. It was a friend who lived across town -- calling to tell her that the cat had just showed up on their doorstep. Another person describes having his cat teleporting from one room in the house to another, after which the cat "seemed terrified:"
All the fur on his back was standing up and he was crouched low to the ground. He looked like he had no idea what just happened, either. That was about 10 minutes ago. He won’t leave my side now, which is strange in itself, because he likes independence, but he is still very unsettled and so am I. And Swancer tells us that it's not just cats. He recounts a tale by "the great biologist... Ivan T. Sanderson," wherein he was working with leafcutter ants and found sometimes the queen mysteriously disappears from the ant nest. "Further digging in some cities within hours," Sanderson tells us, "brought to light, to the dumbfoundment of everybody, apparently the same queen, all duly dyed with intricate identifying marks, dozens of feet away in another super-concrete-hard cell, happily eating, excreting and producing eggs!" However, in the interest of honesty it must be said that Sanderson might not be the most credible witness in the world. He did a good bit of writing about nature and biology, but is best known for his work in cryptozoology. According to the Wikipedia article on him (linked above), he gave "special attention to the search for lake monsters, sea serpents, Mokèlé-mbèmbé, giant penguins, Yeti, and Sasquatch." And amongst his publications are Abominable Snowman: Legend Come to Life and the rather vaguely named Things, which the cover tells us is about "monsters, mysteries, and marvels uncanny, strange, but true." So I'm inclined to view Sanderson's teleporting ants with a bit of a wry eye. What strikes me about all of this is the usual problem of believing anecdotal evidence. It's not that I'm accusing anyone of lying (although that possibility does have to be admitted); it's easy enough, given our faulty sensory processing equipment and plastic, inaccurate memory, to be absolutely convinced of something that actually didn't happen that way. A study by New York University psychological researcher Elizabeth Phelps showed that people's memories of 9/11 -- surely a big enough event to recall accurately -- only got 63% of the details right, despite study participants' certainty they were remembering what actually happened. Worse, a study by Joyce W. Lacy (Azusa Pacific University) and Craig E. L. Stark (University of California-Irvine) showed that even how a question is asked by an interviewer can alter a person's memory -- and scariest of all, the person has no idea it's happened. They remain convinced that what they "recall" is accurate. Plus, there's a little problem with lack of a mechanism. How, exactly, could anything, much less your pet kitty, vanish from one place and simultaneously reappear somewhere else? I have a hard time getting my dog even to move at sub-light speeds sometimes, especially when he's walking in front of me up the stairs at a pace I can only describe as a cross between a "plod" and a "waddle." In fact, most days his favorite speed seems to be "motionless." Given all that, it's hard to imagine he'd have the motivation to accomplish going anywhere instantaneously. As intriguing as those stories are, I'm inclined to be a bit dubious. Which I'm sure you predicted. So you don't need to spend time worrying about how you'll deal with it when Rex and Tigger take a trip through warped space. If they mysteriously vanish only to show up elsewhere, chances are they were traveling in some completely ordinary fashion, and the only thing that's awry is your memory of what happened. ..." even how a question is asked by an interviewer can alter a person's memory -- and scariest of all, the person has no idea it's happened. They remain convinced that what they "recall" is accurate." Welcome to the world of interrogation.